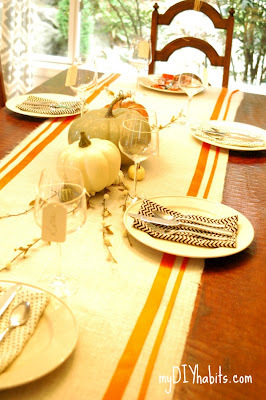 Inside: Transform your dining tablescape into something warm and festive with these inspiring fall table ideas! It’s officially September and everything fall is on its way! 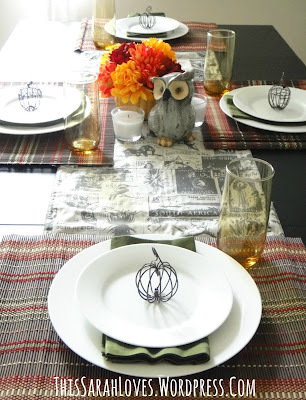 Even though it is still quite hot here in Southern California I couldn’t wait to get in the mood for the season, so I’ve joined forces with four other fabulous ladies to give you some fall table ideas. 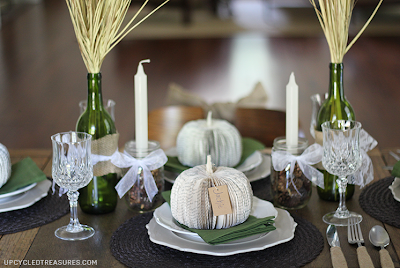 Be sure to visit each blog for the details of their table decoration! 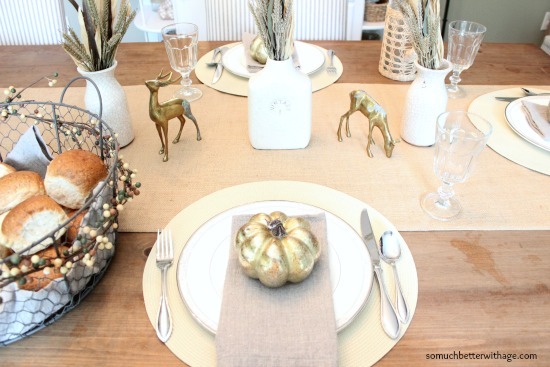 Don’t these tables look so cozy and festive! When I think of fall I think soup, sweaters, cozy, and family. So that ended up being my inspiration for this table. 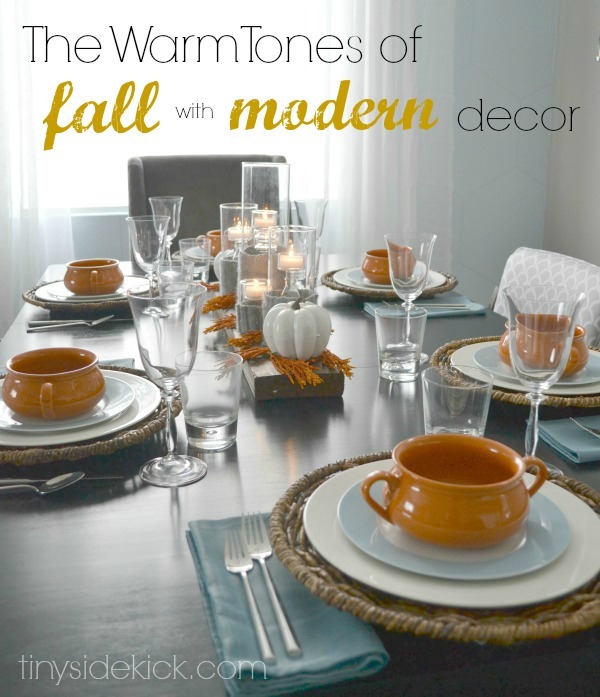 I have lots of blue and grey in my home and every year I try to figure out how to bring in the warm colors of fall. I think I nailed it by working with the blue and adding just a hint of orange and some natural textures. 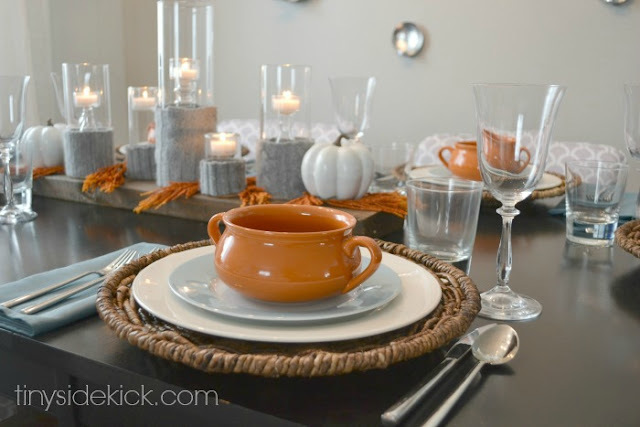 This bridges the modern style of my home with the feel of fall perfectly! This centerpiece was super simple. 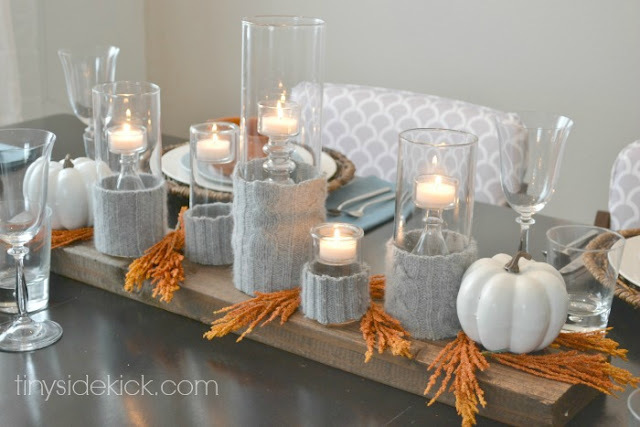 I used old sweaters around the candles to add texture and something unexpected. I couldn’t find real pumpkins (after all, it is still summer), so I picked up these fake ones and gave them a nice coat of white spray paint to make them more modern. Then I found a piece of wood in my garage and gave it a little stain and used it to cluster everything together. The fact that it’s long makes it a centerpiece that won’t get in the way. The wicker chargers bring texture and the natural element from the wood to the edge of the table. My favorite part of this table is that it feels both elegant and casual at the same time and gives me the look and feel of fall without taking away from the modern style of my home. 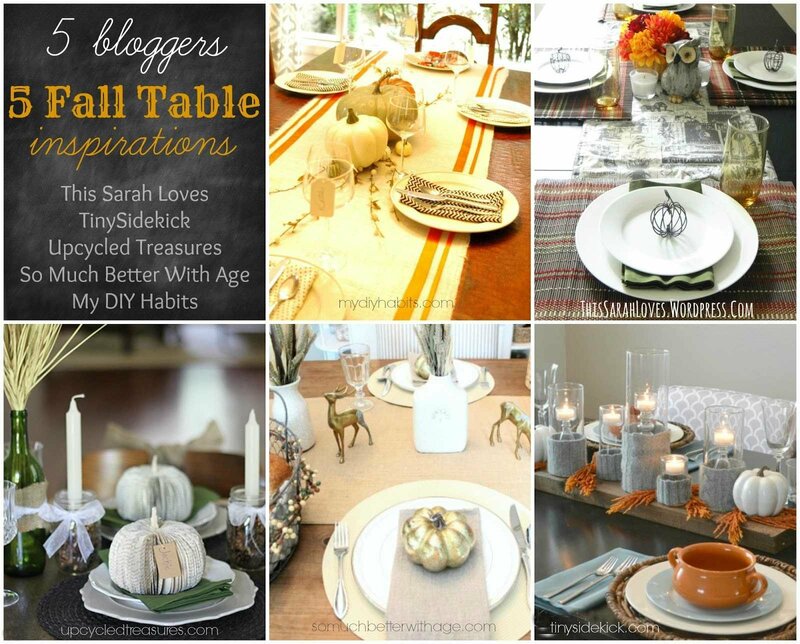 Now it is time to check out the other fall tables! Each of us has a completely different style so hop on over to the other 4 blogs to check out the details of their tables! Where did you get the orange soup bowls with handles?